Macaroni and cheese is the ultimate, indulgent comfort food. It’s warm, buttery, gooey, and cheesy and gets absolutely devoured by kids and adults alike. 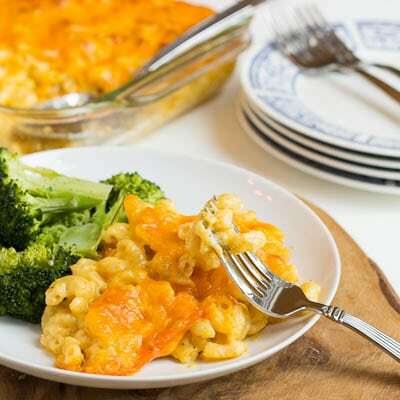 Mac and cheese has always been a popular side dish in the South. Go to any Mom and Pop type restaurant and it’s always listed as a veggie. And my kids ALWAYS order it. Last week I shared a custard-style Baked Mac and Cheese. This one is also baked, but there are no eggs in it, just a large, I mean ENORMOUS, amount of cheese. It comes out of the oven ultra-gooey and cheesy. And it’s one of my favorites. 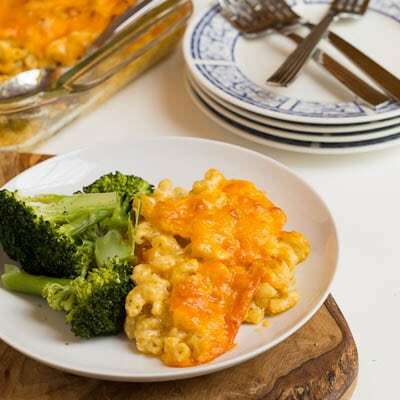 Creamy Mac and Cheese is a super indulgent meal so make yourself feel a little less guilty by serving it with steamed broccoli. 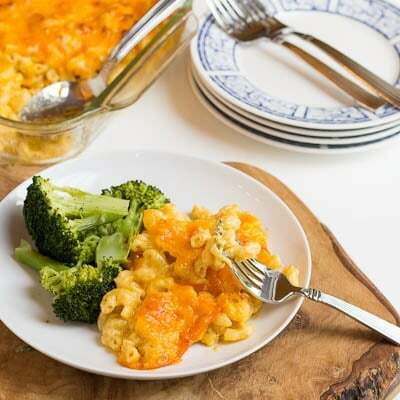 Looking for more Macaroni and Cheese recipes? Check out my Mac and Cheese Pinterest Board. It’s ALL mac and Cheese ALL the time! Melt butter in a large skillet over medium-high heat. Gradually whisk in flour until smooth. Cook, whisking constantly,for 2 minutes. Stir in salt, both peppers, and granulated garlic. Gradually whisk in half-and-half and milk. Cook, whisking constantly, for 8 to 10 minutes or until thickened. Stir in half of sharp Cheddar and all of extra-sharp Cheddar until smooth. Remove from heat. 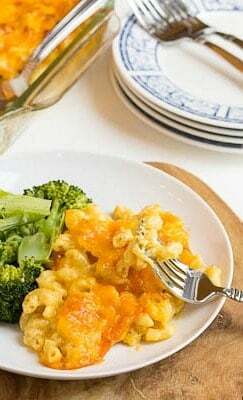 Combine cheese mixture and pasta and pour into lightly greased 13-X-9-inch baking dish. Sprinkle remaining cheese on top. Bake for 20 minutes. If you want a crusty top, bake for up to 15 more minutes. This entry was posted in Main Dishes, Side Dishes and tagged mac and cheese, pasta. Bookmark the permalink. Would it be possible to let me know what half and half is. I’m English, so please forgive my ignorance. Many thanks. I think it’s the same thing as half cream in the UK.